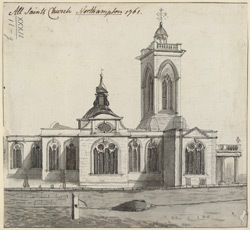 All Saints Church was burnt down in 1675, and rebuilt between 1676 and 1680. The portico was finished in 1701. Travelogue author Celia Fiennes visited the church during its rebuilding and commented: "The Church is new built and is very neate, there are two rows of stone pillars at the entrance of the church on the outside, and it is to be paved with broad stone that was not quite finished, they were at worke at some ornaments at the front." Daniel Defoe visited in the 1720s and noticed the "great new church" as well as the other new public buildings erected after the fire.